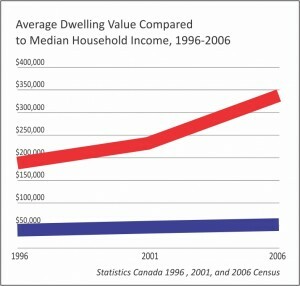 In B.C.’s lower mainland, rising house prices have outpaced growth in household incomes. Vast numbers of homeowners (8.8%) and renters (22.1%) allocate over half their income to housing costs. The same problem applies to cities across Canada, with far-reaching consequences. Yet since 1992 there has been no provision for the design and implementation of a national affordable housing strategy. Clearly, the public, private, or social economy sectors cannot take effective action independently. Imagine instead a policy framework which encourages the collaboration of local actors from all three sectors. The public sector would bring a legislated policy and funding regime; the private sector would bring its efficiency and ability to calculate risk; and the social economy would bring its understanding of needs, management ability, and access to philanthropic resources. Such public, private, social economy partnerships (PPSEPs) have great potential to address the challenge of affordable housing. Three housing developments in the Fraser Valley Regional District show what PPSEPs can achieve. Harmony Housing is an 11-unit townhouse complex in which homeowners can boost their incomes by renting out bachelor suites to seniors or the disabled. The Village is composed of modular units. They were originally dormitories for the 2010 Olympics, and then were moved and assembled into a 3-storey housing and program facility for homeless youth and adults. The Christine Lamb Residence is an apartment building which offers support 24/7 to women and children who have been living in emergency housing. Its design and location are all about building co-operation, self-reliance, and friendship among people on their way back into the community. These projects all required extensive contributions from all three sectors. To make such collaboration more commonplace, 1) generous provincial funding must remain available to communities which “demonstrate need and readiness for multisectoral and multi-agency collaboration”; 2) the social economy should convene networks of local actors who share an interest in affordable housing; 3) these networks should press for additional government incentives. Tax deductions, mixed-use bonuses, direct subsidies, and land grants will encourage more multisectoral collaboration. So would the creation of a Registered Housing Savings Plan based on the current federally-administered retirement savings plan. This article is published in partnership with the Canadian Community Economic Development Network (CCEDNet). It is also part of the i4 special series, Housing We Can Afford, produced in partnership with the BC-Alberta Social Economy Research Alliance (BALTA), with funding from the Social Sciences and Humanities Research Council of Canada (SSHRC).